The motorcycle has Screaming Eagle exhaust that sounds great. 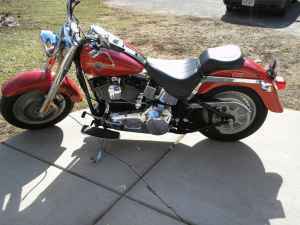 You will find that this Harley is like new including the bright red paint which is not surprising considering that there are only 4800 miles on the bike. I would prefer not to be called by any tire kickers but if you are seriously interested in getting more details or making an offer on the used 2002 Harley Davidson Fatboy for sale in this classified hurry and leave your questions and contact information in the space below provided by Strike Lightning for listing Used Motorcycles for Sale and the owner will get back with you as soon as possible. Strike Lightning would also encourage bikers to submit a review of the 2002 Harley Fatboy for Sale to help potential buyers make informed decisions and to benefit the biker community as a whole.